Each chair is made in just the same way as it has been made for the last three hundred years; the joints are done in the same way, shaped up by hand with spokeshaves, stock scrapers, drawknives etc. and then hand carved before finishing by hand. The only operation that is done differently is the time consuming donkey work that is now done by machine. This in no way detracts from the end product but there is no point in cutting a plank of timber down from one end to the other and taking several hours when it can be done on a bandsaw in several seconds! For copies of Georgian chairs we have stocks of Brazilian Mahogany which is no longer available in England due to an export ban a few years ago. 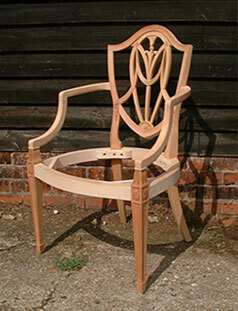 Shown here is a copy of a very fine Chippendale style chair and a copy of a Hepplewhite chair.